Archaeologists studying a Celtic tomb found in Heuneburg, containing the remains of an aristocratic woman and extremely rich grave goods, have recently published their conclusions in the journal Antiquity. 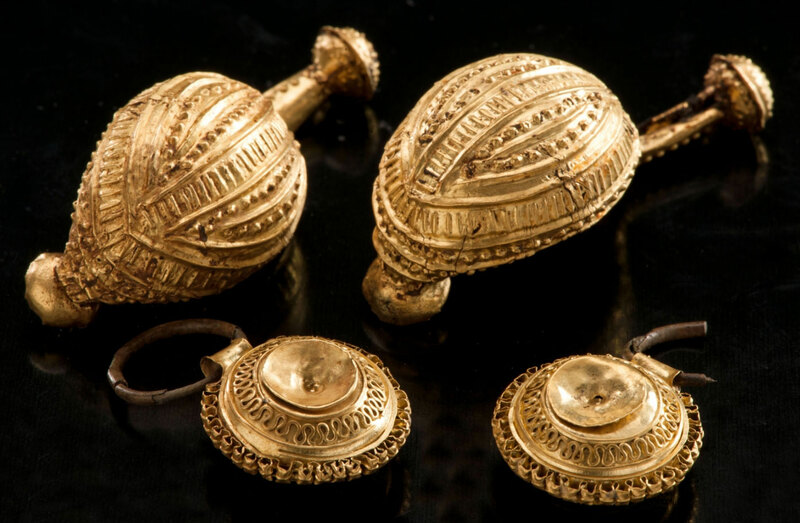 Back in 2010 archaeologists excavating a Celtic cemetery of the hill fort in Heuneburg discovered a very well preserved burial chamber (13×16 feet) containing gold and amber jewelry. The most impressive find was a gold brooch. These grave goods allowed archaeologists to make assumptions about the date of the grave and its owner, suggesting that it must have belonged to a noblewoman of the 7th c. BC, the fort’s early Celtic habitation period. In order to confirm these preliminary conclusions, the entire tomb had been lifted in a solid block of earth and transported to the laboratory of the State Office for the Preservation of Monuments in Stuttgart. There, the grave could be studied in protected conditions, and its timbers and all organic remains could be preserved. Now, according to the archaeologists’ report published in the journal Antiquity, the grave is 2,600 years old. The aristocratic woman was between 30 and 40 years old when she died. She was buried along with extremely rich grave goods: more than 40 pieces of gold jewelry, more than 100 pieces of amber, plus jet, bronze and boar tusk jewelry and accessories, and an ornamental piece of armour for the head of a horse. The skeleton of the “princess of Danube”, as the woman was dubbed in the press, was found articulated and in place, while the skull was 10 feet away. Biological remains from the child’s grave are not enough to do a DNA test. Also, DNA sequencing technology is not advanced enough for this. “But in 10 years, 20 years, maybe we will have the technology,” Krausse said.